Blue Star Families seeks to strengthen military families every day. Through career development, caregiving, and their leading research on military family life, they are striving to better understand and provide solutions to the challenges facing today’s military families. Blue Star Families was actually the first client ever for me at Comit Strategies. I started out managing email accounts, providing user support, and creating small web apps for their website. When I started working with them, they were on a closed proprietary content management system that was limiting. They then had a site designed and developed in Drupal. While I continued to provide support for their website, both their web team and I had difficulty managing the site. Eventually, the site was redesigned and I developed it into the WordPress powered website that they have today. 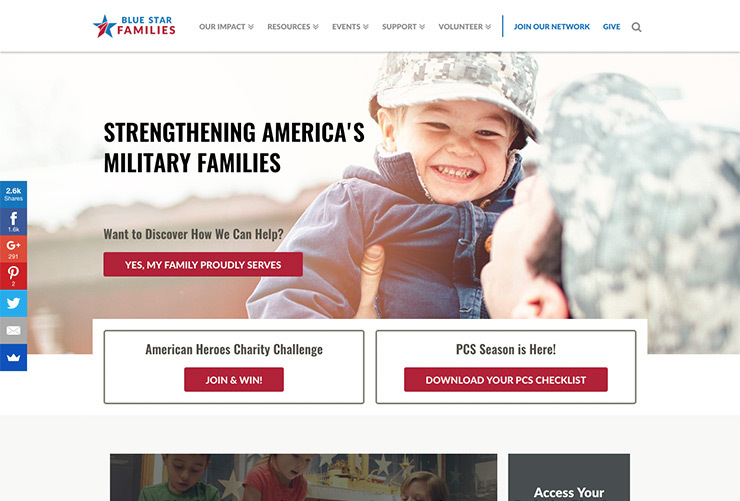 The site design for Blue Star Families included a lot of different ways to display content, and every page of the design was different from another. Because of this, the regular approach to developing pages, where most pages shared a common template, was not feasible. What I ended up doing was creating the site modularly using Advanced Custom Fields. As the site grew and there were pages that needed to be consistent and quickly created, I added custom templates, but these templates shared structure and styling already in place.